The word yucca is a Caribbean name (probably Taino, a native language of Haiti) for cassava, a plant that was once believed to be in the same genus. Yuccas are perennials native to the arid desert regions of North America. Their long, sword-shaped leaves grow in a rosette and are stiff with a sharp tip. The flowers are whitish, six-petaled bells that partially close during the day and open at night. They are more fragrant at night. Y. baccata's leaves extend up to 3 feet in length and are spine tipped, with margins that shred into coarse fibers; its flowers are somewhat reddish brown on the outside and cream colored inside. Y. filamentosa has fraying, twisting threads on its leaf 33 margins and whitish green flowers on smooth, branched stalks. Y. brevifolia can reach a height of 30 feet and has stiff green-blue leaves that are clustered at the ends of the branches. Y. glauca's flowers are more whitish, and its leaves are rounded on the back, with their edges curving in. A pronuba moth lives in the flowers and also pollinates them. Before eating freshly collected yucca flowers, spread them out for a few hours so that any resident moths can escape. The saponins in yucca root are believed to accelerate the breakdown of organic wastes. Yucca can be used in the treatment of arthritis, constipation, diarrhea, gout, indigestion, rheumatism, prostatitis, and urethritis. Topically, yucca root can be prepared as a poultice to treat inflammation, sprains, and skin diseases. Chopping the root and mixing it with water causes it to lather, making an excellent biodegradable soap that can also be used as shampoo to prevent hair loss, get rid of dandruff, and deter lice and other parasites. Although traditionally the root of yucca is used medicinally, the fresh, undried flowers are being investigated for their antitumor activity. Yucca has long served as a wild food. The flower stalks can be harvested before the flowers open and consumed raw or cooked as a vegetable. The flowers can be eaten raw; they also are sometimes made into tempura or added to stir-fry dishes. Some yucca varieties have fruits that dry up at maturity, while fruits of other species remain fleshy. Those that dry at maturity can be eaten unripe, but they must be peeled and are often more edible if boiled. The fleshy varieties can be consumed raw. Yucca seed pods can be eaten as a vegetable or ground into flour. 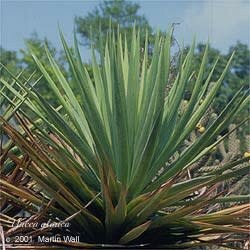 Some species of yucca are made into the intoxicating beverages tequila and mescal. Fibers can be peeled from the leaves after they have been soaked; the fiber is used to make shoes, rope, mats, fishing line, brooms, paintbrushes, baskets, and sewing needles. The core of the plant's center stalk can be used as tinder. The roots of Y. filamentosa were once pounded by native peoples and added to corralled fish to stupefy them. The juice from the leaf was used to make poison arrows. Steroidal saponins extracted from yucca have been found to improve the growth rate of alfalfa, citrus trees, onions, potatoes, strawberries, and tomatoes. Use only dried yucca root, as the fresh root can irritate the digestive system. Avoid during pregnancy. The fresh leaves have been reported to be toxic to livestock and should not be consumed.